The Amazon links below are affiliate links, which means if you buy it, Modern Forager may get some cash money. Thank you! The African Market Basket is one of our favorites. We typically leave it in the back of the car as a storage container and use it as an overflow container to sort our findings into before the next stop. 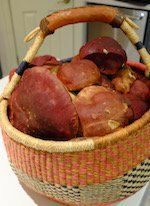 We don’t often carry the African Market Basket when we forage because it is too round and is constantly banging against our thighs. Furthermore, it has a nice handle, but no good should strap option. Look for a Fair Trade version if you buy one. The Sagaform Bag is our all-time favorite and the one we usually carry. It is very light and has lots of mesh to release spores. Plus, our mushrooms stay are cleaner because the sand can fall out the bottom. This bag has separate compartments and a handle that is the perfect length. It can be put over the shoulder, but, we usually have a carabiner and attach it to our backpack for the hike in and hike out. The downside is that it is not really big enough for a big haul. This bag also comes with a knife that is not half bad! The Folding Market Basket is another all-time favorite. It is a little bit heavier than the Sagamore bag, but is spacious and hard-sided. It has a handy divider that can separate the basket into halves or thirds. Its rectangular shape means it doesn’t bang the thighs. We attach a big carabiner to the handle and attach it to our backpack’s shoulder straps for the hike out. It is pretty durable and has survived several seasons of hard work. The downside is that it does weigh significantly more than the Sagaform. The Mesh Tote is also handy to keep around. We often carry one in the bottom of our backpack just in case we find 15 lbs of porcinis or a ton of morels. It’s kind of large and amorphous for a primary bag though. Generally, we like to give our mushrooms a little better protection. Great in in a pinch. Try this smaller version too. The Opinel Mushroom Knife is Kristen’s favorite. It is a beauty and it’s sharp. No doubt. Made in France, this knife has a beechwood handle and the all-important boars hair brush. The Rough Rider Mushroom Knife is trent’s favorite. Light. Easy to open. Doesn’t get sticky when wet. Not to sharp. Boar’s bristle brush. Again, easy to open! Only $10. 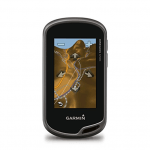 Garmin Oregon 650t handheld GPS Unit with camera. Expensive… but, awesome performance in the field. Recommend the 4GB version that will let you download oodles of Birdseye Satellite maps from the Garmin Basecamp software. Expect to spend $100 more on a good topographic map of your region. Yikes, right? I hope this lasts a lifetime. If you want a good rinsing tool for your foraged food look no further than the Linden Sweden Berry Cleanup tray. It is just perfect for the job… turn it over and it becomes a drying tray. For air-drying our mushrooms after washing, we use Baker’s Secret racks with a small fan. Sometimes we need to air-dry mushrooms, notably when we are camping a few days and don’t have access to a dehydrator. This is a collapsible hanging mesh drying rack. It is a 2 foot diameter cylinder with 8 layers. We hang this from a tree put our mushrooms into it. Put it in a sunny spot and they will start to dry. Or, put it in the shade and use it to store fresh mushrooms. If you pack the mushrooms into a paper bag, they will lose less moisture to the air. We own several dehydrators and they all work. It is easy to recommend the inexpensive Presto 06300 Dehydro Electric Food Dehydrator which is $35 and works like a charm. We recommend you also get an extra set of trays so you can dry 8 racks at once. Don’t be tempted to buy Presto’s more expensive model with a temp control and timer… it is much louder! That said, if you already have a dehydrator, use it! But, beware using your stove or toaster… that just doesn’t work very well. And, if you don’t use a dehydrator, your mushrooms will likely go bad when stored in air-tight containers. Bear Bells rock! We bought them originally to wear ourselves, but, now we primarily use for our dog, Benzie. We attach these to his collar so he won’t surprise a bear either. We’ve also found that it is a lot easier to keep track of him in the woods with the bell as we can hear him running around. These bells come with little magnets that will damper the bell and a very sturdy velcro attachment. A good rain jacket is one of our TOP priorities. We always have it stuffed into the bottom of the backpack. We are fans of the Pertex Shield+ rain jackets for their breathability. Kristen sports a RAB Muztag and Trent a REI Rhyolite. 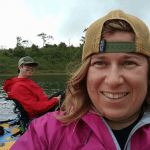 For a less expensive option, the Marmot Precip gets great reviews. 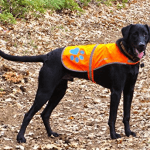 When hunting season rolls around, we like an orange dog hunting vest to make sure Benzie is easily visible to hunters. Between that and his Bear Bell, he is easy to spot! This model is easy to put on and he doesn’t seem to mind.